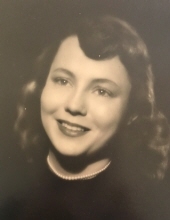 Sue Ann Ferguson (85) passed away peacefully at her home on January 23, 2019. She was born in Ponca City, Okla., on March 5, 1933, to John Albert Lawrence (Jack) and Dorothy (Huffman) Thomson. Even though she was shy as a child, she loved to tell the story of how as a very young girl she got up on a table in Colorado Springs and sang the Texas Bluebonnet song to the troops stationed there. She enjoyed singing and acting out musicals with her playmates. As a leader in an junior high sorority system, administrators sought her help. She worked to shut down the elitist system, earning few friends but taking pride in doing the right thing. She had an interest in journalism and served as co-editor of the Ponca City High School paper until her graduation in 1951. For years she would joke that her future husband, Lewis Ferguson, was "only" the sports editor. Lew had a long, distinguished career with The Associated Press as a sports and political reporter, culminating with his induction to journalism halls of fame in Kansas and Oklahoma. Though it was journalism that first captured Sue’s interest, her disdain for deadlines pushed her to education. Sue majored in psychology and special education at the University of Oklahoma where she was a member of Chi Omega sorority and graduated in 1955. She married Lew on June 5, 1958. Following his journalism career, the couple moved to Sioux Falls, SD, in 1959, then to Minneapolis in 1961. Along the way, Sue taught kindergarten in Oklahoma City, Sioux Falls and Minneapolis. After Sue and Lew’s children were born, John Michael (Mike) in 1964, and Diane Marie, in 1966, she stayed home with them. The family moved to Kansas City in 1968 and Topeka in 1970 where they would live for 30 years. Sue resumed teaching in 1974, working as a Title I reading instructor at several Topeka public schools during her 21 years. When she retired in 1995, she joked that she’d done playground duty at 17 different schools. She was always engaged in the world and concerned about human and civil rights. When her children were young, she sent their gently used clothing to Alabama during a difficult time in the civil rights movement. She admired Dr. Martin Luther King, Jr. and President John F. Kennedy. In her final weeks, she was disturbed by the inhumane treatment of immigrants at the Mexican border. Until the very end, Sue was sharp and active in researching the genealogy of her family and Lew’s alongside her sister-in-law Kathryn Ferguson. The two collected a trove of historical family stories. She was proud to come from a line of educated Presbyterian ministers and missionaries who worked with Native Americans. She traced her ancestors’ lives through the Ohio River Valley to Oklahoma land runs. In 2005, Sue and Lew retired to Ponca City. They enjoyed travelling to visit their long-term friends, Gene and Karen Lahammer in Arizona, and Diane and their granddaughter, Helena DuGard, in Los Angeles. Sue enjoyed a range of movies, from the classics and musicals to modern films. She loved music, especially Paul Simon, Janis Ian, Willie Nelson, and Hank Williams. Lew Ferguson preceded her in death in August 2017. Sue is survived by her son Dr. John Ferguson, her daughter Dr. Diane Ferguson, her grand children Abby Ferguson, Helena DuGard, Todd Ferguson, her daughter in law Dayna Ferguson. She is also survived by her sister, Linda Merrifield and her daughter, Shelley Holland, her sister-in-law, Louise Gelmers, her brother-in-law Donald Ferguson his wife Kathryn, her caregiver and former daughter in law Kelly Orser. She leaves behind several nieces and nephews, cousins, and many happy memories. A funeral ceremony for Sue will be held at 2:00 pm on Saturday, February 2, 2019 at Grace Episcopal Church in Ponca City, OK. Following the ceremony, she will be laid to rest next to her husband at Resthaven Memorial Park. In lieu of flowers, the family asks for donations to benefit Peachtree Landing, 105 W. Hazel Ave., Ponca City, OK 74601. To send flowers or a remembrance gift to the family of Sue Ferguson, please visit our Tribute Store. "Email Address" would like to share the life celebration of Sue Ferguson. Click on the "link" to go to share a favorite memory or leave a condolence message for the family.